Venus Williams beats her younger sister Serena in Thursday's night session of the Mubadala World Tennis Championship. The 11th edition of the Mubadala World Tennis Championship (MWTC) got off to an exciting start at the International Tennis Centre at Zayed Sports City on Thursday. Defending champion and 2018 Wimbledon finalist Kevin Anderson and Next-Gen star Karen Khachanov booked their places in Friday’s semi-finals, where they will play world number two, Rafael Nadal and world number one, Novak Djokovic respectively. 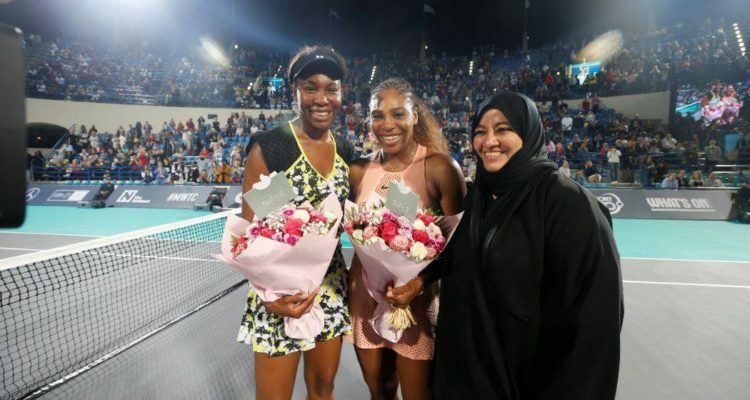 But in what was undoubtedly the highlight of the day, 23-time Grand Slam Champion, Serena Williams, took on older sister and seven-time Grand Slam Champion, Venus Williams, in what was their first-ever meeting in Abu Dhabi. After making the mother of all comebacks at last year’s Championship, Serena showed why exactly she is considered among the all-time greats as she broke her sister in the fourth game aided by a series of unforced errors from Venus, to take a 3-1 lead in the opening set. However, 38-year old Venus broke her sisters serve in the ninth game with a wonderful lob that deceived her younger sibling. But Serena dug deep to break right back and claimed the opening set 4-6 in just 39 minutes. The packed-out stadium was treated to a wonderful game of tennis as the sisters clearly showed that they can still be fierce rivals on the court. The players traded service breaks in the second set before Venus stepped it up a gear and broke Serena twice more to take the set 6-3. Venus continued her momentum into the super tiebreak with a series of powerful forehand winners, to win the match 10-8 in an hour and 26 minutes. his second appearance in Abu Dhabi, broke Chung in the sixth game of the opening set to take a 4-2 lead, but the highly rated Chung broke back in the ninth game to tie it up at five games all. A series of unforced errors in the tie-break saw Anderson go down 6-7 (4). But 32-year-old Anderson quickly bounced back and showed his prowess as he quickly found his range and raced to take a 4-0 lead in the second set. The Australian Open Semi-Finalist, Chung, had no answers to Anderson’s aggressive game as the 6’8” South African closed out the second set 6-2. It was much of the same in the third as Anderson, who by now showed glimpses of his scintillating form from last year, by breaking Chung in the opening game. He quickly found himself in trouble in the second game, but he used his big serve to get him out of trouble fighting back from 15-40 down to take the game and then wrap up the set and match. In the second match of the day, Next-Gen star Karen Khachanov continued his red-hot form earlier this year by beating Austrian world number 8 Dominic Thiem in straight sets 7-6 (3), 6-3. The 22-year-old will next face world number one Novak Djokovic who he beat in the final at the Paris Masters. The first set was a closely fought affair with both players exchanging service breaks before Karen took the set in a tie-break. In the second set, the 6’8” Russian blew away his opponent with his powerful forehand winners and wrapped up the match in an hour and 18 minutes. With all six male players in actions, Day Two is not to be missed. The action kicks-off at 3pm as Hyeon Chung takes on Dominic Thiem for the fifth and sixth place followed immediately by the first semi-final between world number two Rafael Nadal and Kevin Anderson at 5pm. The second match will see world number one Novak Djokovic go head-to-head against Karen Khachanov at 7pm for a place in the final. MWTC tickets are priced from AED 100 and can be purchased from www.ticketmaster.ae. This entry was posted in Mubadala World Tennis Championships Abu Dhabi and tagged Abu Dhabi, Mubadala World Tennis Championship, MWTC, Serena Williams, Venus Williams.